About Me: I’ve not had much opportunity to travel until relatively recently, so I’ve aimed quite high when I did. I’m a self-confessed photography nerd, so can often be seen lugging camera equipment around to various places of interest. I’ve been lucky enough to travel to Japan twice in the last few years, both times I’ve been based in the capital Tokyo. After spending a combined total of 5 weeks there, I can still only say I’ve seen a tiny portion of one of the most amazing cities in the world. I can’t possibly write about all the things there is to do and see, the list would be simply endless. I was staying in Shinjuku, one of the many sub-districts and the main entertainment zone, in Tokyo. It is also home to Tokyo’s Metropolitan Government building – a split tower sky scrapper with 48 floors, the uppermost of which are both open to the public and offer stunning views over the incredible urban sprawl. You also get a good look at the Park Hyatt Hotel, which famously features in the film ‘Lost in Translation’ – it houses the New York bar which is open to non-guests should you wish to get your Bill Murray on and live it up with a whiskey and some live Jazz ’Close your face… Roger Moore’. The trip up to the bar alone makes it worth it, requiring a change of elevator and crossing the luxurious lobby and library half way up. Be aware that prices are expensive and a seating charge is mandatory. It’s a good idea to dress up, although not overly strict, it does help if you don’t stick out too much. Golden Gai is well worth a visit for those seeking something a bit different, it’s a small collection of ramshackle bars that sees visitors from all over the area, both tourists and locals. Some of these bars require you to be able to speak Japanese, however most welcome foreigners and have a great atmosphere on offer which is well worth experiencing, along with maybe some karaoke (after a few beers you will). Kabukichō is another famous attraction, although known for being Tokyo’s red light district, many great restaurants and bars can be found here and it has become a regular tourist haunt in its own right. Check out St. James standing bar if you are in the area, the patrons are very friendly and it’s easy to while away some time practicing your Japanese with a few beers (while they practice their English). The staff are great and it was an excellent place to hang out in the evening – just don’t challenge the owner, Sanada-san, to an arm wrestle; I’m pretty sure he’s invincible. One thing to be aware of when walking around the main streets of Shinjuku in the evening, you will find there are numerous people that will try and solicit you to go to their bars and clubs, as well as other things – they can be quite persistent, it is best to be polite but firm and they will leave you to continue on your way. While it can be irritating, especially as foreigners are actively targeted, it is just part and parcel of the experience. Shinjuku Gyoen (a large park) should be one of your stops during a visit, especially during the cherry blossom season, its spectacular in full flow and with so many Japanese out to enjoy it there is a great atmosphere. Shinjuku Station is situated on the Yamanote loop – Tokyo’s main circular train line, meaning it is very simple to travel to all the other districts of the city as well as further afield. The station is a sight to behold in itself, classified as the world’s busiest transport hub by the Guinness book of records with 3.5 million people passing through it per day – it does get a little crowded when running for the last train. The popular sights of Harajuku (for those interested in some amazing fashion) and Shibuya (home to the world famous pedestrian crossing) are only a couple of minutes away by train, literally just 2 stops up the line. I’d recommend spending as long as possible in Japan, there is so much to see and the cities move at such a rapid pace it’s all over before you know it. I can’t wait to go back! One of the biggest mistakes foreigners make when walking around the capital is only looking at street level. Tokyo is full of skyscrapers, 1000s of bars, restaurants, shops, arcades etc. are found on the upper floors of buildings and are usually just indicated by small signs at street level. If you plan to do a lot of travelling whilst in Japan it is worth investing in a JR rail pass – these are only available outside of Japan so you must book one before travelling. They will allow you to ride the majority of JR network trains all over the country including the Yamanote loop and the world famous Shinkansen Bullet train for no cost (other than the original price of the pass). About Me: I work full time and have an active lifestyle so when it comes to holidays I love a good relaxing sunny break by the pool but an active and adventurous holiday still does it for me. We went to Florida for 2 weeks; the flight was long roughly 9 hours but well worth it. We rented a car while we were there, so traveling to each park was easier. It worked out cheaper as well. We stayed in one of the Disney park hotels. It was expensive for somewhere to stay as we were out all day, so I would suggest booking a hotel just outside Disney, unless you have kids then the Disney hotels do have a lot of perks for them, activities for kids though out the day, breakfast and lunch with the Disney characters, pools and many more exciting things. I would suggest trying to get to all of the parks as they are all amazing. Sea life – you can swim with dolphins, but you have to book months in advance to get a space. Wet and wild – Amazing water park, activates for the kids and for adults. Some of the highest vertical slides. I would pre book all of your park tickets, as it will work out cheaper. Try and catch a street parade, at one of the parks, they are amazing, the night time ones are even better. They tend to have them every hour. There are a lot of outlet markets to go to, so if you like shopping, I would suggest going out of Disney to do a bit of shopping. There are some lovely restaurants outside of Disney also, so make a day of it. Overall I would say 2 weeks was perfect for what we wanted to see and do. Wear comfortable shoes, you will be walking, a lot! Book all the parks well in advanced, you can get them cheaper when you pre book them. Always wear sunscreen, even if it is overcast the sun can still burn you. Try and visit all parks, it’s well worth it. If you’re on a budget then get a hotel just outside Disney, you will save a fortune. Consider renting a car for the entire trip to avoid paying high taxi fares. About Me: I’ve been part of the M&S team at K International for nearly 2 months now and I’m really enjoying it! I’ve always loved languages, studying French and German at University then going on to do a Masters in Applied Translation Studies (still on-going!) As part of my degree, I had to do a year abroad, which I spent in various parts of France and Germany. To help with my job (and because I miss that feeling when you first start learning a language) I think I’m going to take up Dutch next – so watch this space for a blog about crazy antics in Amsterdam..! I actually worked in Munich as an au pair at the end of my year abroad. Although the family were not the most welcoming of people and my stay resulted in the stay-at-home, native German mother’s realisation that she didn’t actually need anyone else to look after her house or teach her children English…I loved the city! Since my Dad’s cousin has lived in Munich for years, I’d already been when I was 8 (I remember my age because, at a meal out in a restaurant, our waitress had replied to a question from my Dad’s cousin with ‘nein’, to which I’d retorted ‘no, I’m 8!’). I distinctly remember crying uncontrollably on our visit to the famous beer festival because my eyes were full of smoke and I was terrified of all the people swigging beer and singing in German at the top of their voices – no such reaction this time! Munich’s Oktoberfest has to be seen to be believed. I’d been prepared for it by a trip to its baby sister, the Stuttgart Frühlingsfest, during my semester studying at the University of Tübingen in Baden-Württemberg. I remember some German pros telling us that the huge steins filled with beer NEVER BROKE but lo and behold, one ‘Prost!’ too many and my friend saw hers shatter into millions of pieces! Neither that nor falling off a bench from jumping just a bit too hard spoilt our fun though and we came away knowing all the beer hall anthems off by heart! Going out for breakfast is something I miss since returning from Europe, and Munich is the perfect place to do this with all its beautiful roof terraces. There is a particularly nice one on Marienplatz, opposite the Rathaus. For some free entertainment, be sure to watch the Rathaus’ delightful Glockenspiel (at 11am every day), visit the many beautiful churches (the well-hidden and unassuming Asamkirche is absolutely stunning inside) and run through the open fountains at the end of the main shopping street. There are some good shops in the city but I would take advantage of a destination steeped in such history, and go on one of the many tours. I went on a very interesting 3rd Reich one, which ended up at the former ‘Hitler HQ’, now a performing arts school! You can also get to the concentration camp at Dachau on the Straβenbahn. Finally, I would recommend a visit to Olympiapark, where the Olympic games were held in 1972. It’s a lovely open space and, if you’re lucky, you can sit up on the hill and listen (and almost see) a live concert for free (we went for Meatloaf and the atmosphere was amazing)! Drink beer not wine at Oktoberfest, it’s the way it should be done and you’ll end up paying far too much if you wimp out (have a Radler if you can’t bear all that beer). 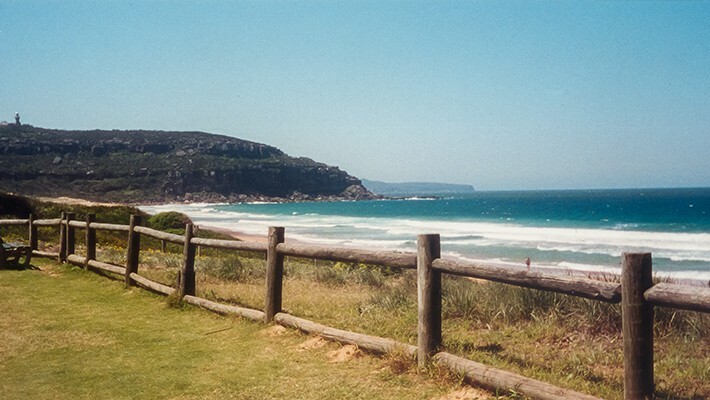 In February 2001, we went backpacking on the East Coast of Australia. 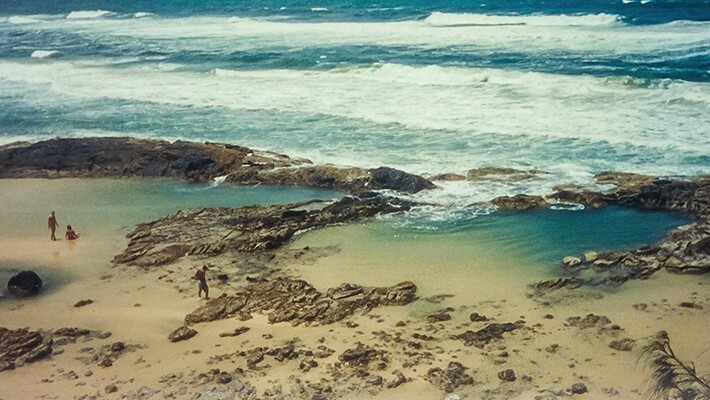 After discovering Sydney and its famous landmarks, we headed to Fraser Island, a few hundred kilometres from Brisbane. The largest sand island in the world, Fraser Island is a World-Heritage listed site: it offers both luxurious rainforest and stunning beaches. We shared a 4×4 and camping equipment with 8 complete strangers, which proved to be a very funny adventure. Lake McKenzie is picture perfect, and is made up of rainwater only. To protect the lake’s water purity, rangers recommend that tourists refrain from using sun cream before swimming in the lake. 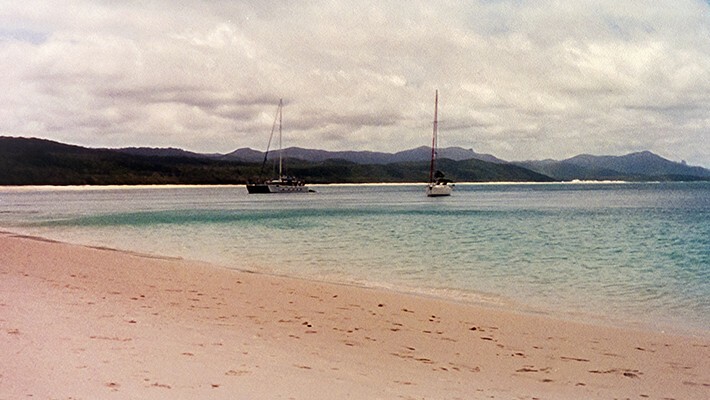 The island is inhabited by many species of wildlife, including dingos, a type of wild dog. They roam the island freely and although humans are not allowed to feed them, they do wander into camp sites and (very) close to tents whenever they like. We camped on the beach for several nights and it was quite something to see their eyes glowing in the night! 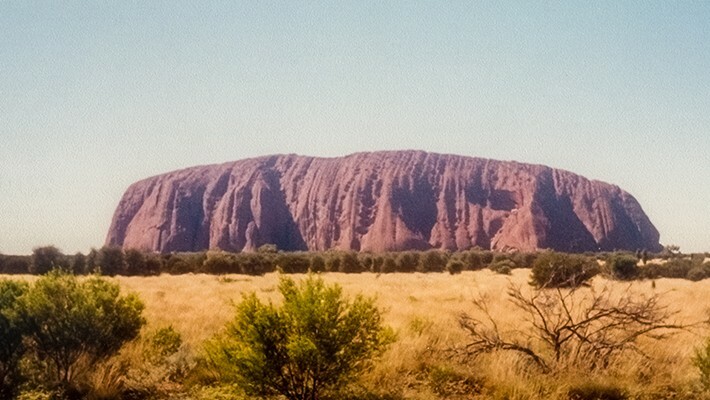 We also spent some time around Ayers Rock, or Uluru as it is known by the Aboriginal people. It is a monolith located in the Outback. Temperatures soar very rapidly there so you have to set off very early if you want to walk around Uluru (over 9 kilometres). If you normally mock the Australian fly hats, then think again: it is one of the most useful piece of kit there! 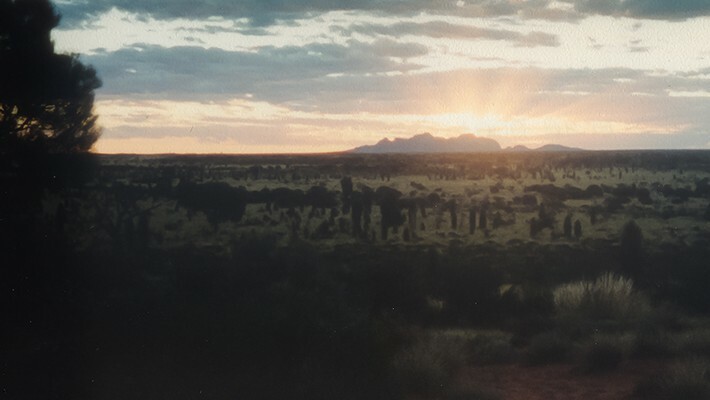 Some tourists climb Uluru (I guess the photo opportunities must be quite spectacular), although this is something Aboriginal people do not appreciate, for two reasons: the spiritual significance of the rock and the safety of visitors. For me, nothing beats sleeping under the stars in this part of the world, it’s simply breathtaking: imagine being able to just stare at the sky and all the stars, for miles on end and in pure silence… bliss. The seasons are opposite to those of the northern hemisphere i.e. 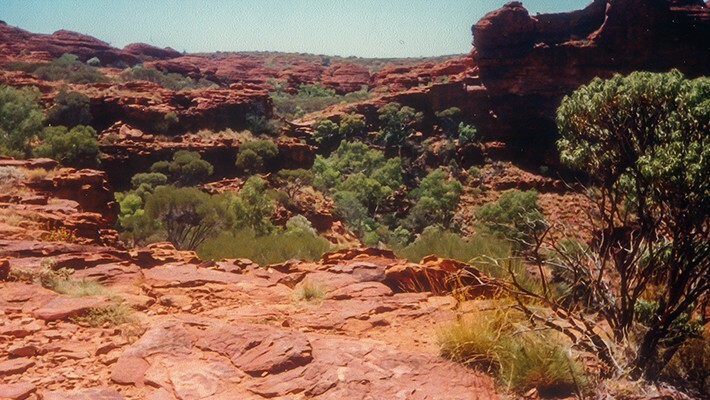 summer in Australia falls between December and February.If you visit the Northern Territory, make sure you drink plenty water and use factor 50 sunscreen. They say you should always tap your shoes before putting them on… Don’t be afraid of the legendary creepy crawlers, just get to know who they are (the chance is you won’t see any)! About Me: I enjoy seeing and experiencing new things, the list of places I want to visit is virtually endless. I have travelled as far as the Philippines, to Greece, France as well as other European countries and all over the UK…out of all the places I have been to, my favourite place has to be a small area in Switzerland, just outside of the Capital City Berne. My favourite destination is a place called Bolligen – it is roughly 15 minutes by car / train Northeast of the capital city, ‘Berne’. This municipality sits in a lovely location with beautiful surrounding countryside, great for walks, relaxing and immersing yourself in Swiss culture and tradition, while still remaining very close to the capital. When people think of Switzerland it is often things like Chocolate, Swiss Army knives, watches, cheese (emmental) and cow bells that spring to mind…and yes all of this can be found throughout the city. From Museums to Markets there are an abundance of things to see and do there. ‘Berne’ like many cities, although beautiful, is now heavily populated with tourists from all over the world so it is more difficult to get a feel of the Swiss culture; whereas there are predominantly Swiss-German people living in Bolligen. I would recommend staying somewhere rural like Bolligen and travelling into the City. If you don’t want to travel into the City and are looking for a local restaurant then there are a couple of nice places to eat / drink – one is ‘Landgasthof Sternen’ and the other is called ‘Linde’ at opposite ends of the municipality (both serving Swiss traditional food with regional dishes, along with more international foods). There are also some small shops around and an indoor swimming pool (Hallenbad Bolligen)! The buildings in both the immediate, and surrounding area, are very pretty, it is rare to see a house, old or new without shutters – They are great for protecting the houses in stormy weather and keeping the bugs and heat out when it’s really hot…and if you don’t like to be woken up by the sunrise, they are much better than curtains alone. You will find many places to walk in the area; there is the ‘Bantigar’ Mountain, which is a fairly modest, 100 metres high, when compared to some of the other mountains in the region. Here they have the tower for Swisscom, which supplies the surrounding region with television and radio, the tower can be climbed and you can see for miles around. The views from the municipality are amazing – In some parts of Bolligen, depending on where you are, you can see the ‘Jura’ mountain chains, ‘Swiss plateau’ mountains and the ‘alps’…it is best of course when there are no clouds. The weather in summer is hot and sunny and in winter it is cold and snowy; they still have seasons, which is great! Unlike the mysterious weather of the UK, so generally you know what to pack. Everywhere I have been in Switzerland I have seen rich and diverse landscapes of hills, mountains, forests, lakes and rivers – so I am sure you will love the country wherever you decide to stay! The famous mountain the ‘Matterhorn’ is situated in the Canton of ‘Valais’, which overlooks the town of Zermatt. Valais is in the Southwest of Switzerland, the glacial ‘Rhône’ valley is at the heart of this Canton and is well worth seeing. Zermatt has spectacular views, it is around 2.5 hours’ drive from Bolligen; the town of Zermatt is lovely also! Not only can you see the ‘Matterhorn’ from this town but if you want to see the surrounding mountain scape, you can take the Gornergratbahn to Gornergrat, just south of Zermatt – this is the highest open-air railway in Europe. If you want to visit some rivers, which have often travelled miles from a glacial origin, the River ‘Aare’ and ‘Emme’ are both about 40 minutes’ drive from Bolligen. You must visit ‘Lake Thun’, it is about a half hour drive away from Bolligen, I would say it is best to visit during the summer as they run small boat rides around the lake – the water is a luscious turquoise blue and near the banks you can see the bottom of the lake – a very relaxing day out. ‘Interlaken’, is also about 40 minutes away – this is a well visited place within the ‘Bernese Oberland’ region of the Swiss Alps. ‘Bernese Oberland’ (Bernese Highlands) is the highest mountainous area in the Canton of Berne. ‘Lake Lucerne’ in north-central Switzerland, just over 1 hours’ drive from Bolligen, a little further away but worth visiting – you can see the ‘Mount Pilatus’ mountains which are part of the Swiss Alps – the top can be reached with the Pilatus railway – this has the steepest cogwheel railway in the world, it will usually run from May to November depending on the weather. There are several wooded areas to visit and take long walks, but a popular one I would recommend is ‘Grauholz-Sädelbach’. ‘Tierpark Dählhölzl’ (Dählhölzl Zoo) is in Berne and about 15 minutes by car and 40 minutes by train and foot. It is situated near the River ‘Aare’ and inhabits about 3,000 animals, over 37 acres. They also look after the ‘Bärengraben / BärenPark’ (Bear pit / Bear Park) which is in the Eastern side of Berne, it is a Swiss Heritage site, which has national significance; brown bears are kept here and you can see them from the bridge above the River ‘Aare’ that runs through the City. If you are lucky enough to be in Switzerland on the 1st August – Swiss National Day, I would recommend joining in – often around the area of Bolligen, there are large bonfires and fireworks to celebrate Swiss national day; a very patriotic day. Nearly everyone has a large flag soaring above their house…and you can buy everything with a Swiss flag on it…from napkins, to candle holders, tea lights shaped like a Swiss cross, cakes / bread with the flag design on – it is a massive celebration. Rösti – this is a dish round in shape, made with grated potatoes and usually fried in a pan. This predominantly consists of grated potatoes, but things like herbs, onions, bacon, cheese and apples are often added. It was once considered a breakfast food on its own, but now is often served as an accompaniment to other foods. Fondue – this is a pot of melted cheese which everyone around a table shares; it is eaten with pieces of bread, dipped in with long handled forks. Raclette – this originated in the Swiss canton ‘Valais’, traditionally it will be melted in front of a fire, and accompanied with potatoes, pickled onions, diced meats, gherkins and commonly ‘Bündnerfleisch’. Kirsch – more a product of Germany, but something which I would recommend trying. It is like a cherry flavoured brandy, but clear in colour and not very sweet. Bräzeli – these are biscuits made with a Bräzeli Iron (Brezeleisen), they have very pretty patterns, made simply with flour, sugar, eggs, butter and spices, but very tasty. Mailänderli guetzli – this is usually a Swiss lemon butter biscuit but it can also contain chocolate – a favourite at Christmas time, but it is great anytime of the year. Zopf (Züpfe) – this is traditional Swiss bread usually eaten for Sunday breakfast, with a golden / brown crust and often baked in the form of a plait (zopf meaning ‘braid’). Lebkuchen – originating in Germany it is also very popular in Switzerland and often eaten around Christmas, it is like a cake/ loaf and tastes a little like gingerbread – with ingredients such as honey, aniseed, coriander, ginger, cloves, allspice and cardamom and even almonds, walnuts, hazelnuts and sometimes fruit. In Switzerland most people greet you as they walk by, more in rural areas – so to greet someone in German speaking Switzerland, you would say ‘grüezi’ (pronounced gru-sse which is formal) or ‘salü’ (which is in-formal). ‘wie gaht’s’ or ‘Wie geht es Dir?’ – How are you? People who speak Swiss-German will understand German speaking people, whereas German speaking people may not understand the Swiss-German dialect. About Me: I love travelling and am from the Netherlands originally. I look after some of our big corporate client such as Tesco and Marks & Spencer. I prefer making big trips when it comes to travel, having lived in Dubai for a year and holidays in the US and Cuba. I’m going on maternity leave soon, so my travel days are over for a little while. I am looking forward to this new challenge of becoming a mummy! The risk with Las Vegas is that you will either love it or hate it; the Marmite of West Coast USA. If you are not into gambling, make sure you plan lots of other things to do, or make it part of a bigger trip, which is what I did. Las Vegas was the start and end of a driving holiday though Nevada and California, visiting Yosemite national park, San Francisco, Monterey, and Los Angeles. Las Vegas is all about the hotels and the strip. We stayed at the Luxor and at the MGM Grand. Pick your hotel to suit your stay. Circus Circus, for example, is great for kids, the MGM have a great pool and the Wynn or the Bellagio are set up for complete luxury for couples. As I said, it’s all about the hotels, and every hotel has their own style on the outside and in. Make sure you check out the décor of each, but be prepared to walk, a lot! The Bellagio is my favourite; it has a conservatory which is decorated with different plants and themes every season, plus their world famous fountains are spectacular. Watching the fountains to Elvis’ Viva Las Vegas was my husband’s Las Vegas highlight. Almost across from the Bellagio is the Venetian which warrants a visit to admire the painted ceilings and do some people watching along the indoor Venetian canals complete with gondolas! With more shows available than you can count, it can be hard to choose. Cirque du Soleil are definitely at the top when it comes to shows, they have something for everyone, bringing out new shows and also keeping audience favourites. We saw Ka at the MGM Grand, and it had nothing to do with the little Ford cars (that you will not see in the US by the way). Ka is a story that includes a huge variety of acrobatics and martial arts with an amazing cast and a breath-taking stage. You will know what I mean when you have seen it. One last tip, Las Vegas is in the dessert – inland. In the summer it’s hot! Time your trip to suit your plans. Pick up a discount voucher. Even before you fly, go online and print some off. You can score money off your lunch, a show or a helicopter ride. About Me: Been at K for ages (am the 2ndlongest serving employee after Liz). Loved the company so much I bought it in 2013. One of the best things about my job is the amount of traveling I do. My top five favourite cities in the world are, London (when the sun is shining), New York, Paris (I know it’s a cliché but its best in the spring time), San Francisco and Budapest. Every year we are lucky enough to be invited to attend memoQfest in Budapest. This is booked way in advance in my calendar. In 2013 I was the keynote speaker which was without doubt a highlight in my career. Anyway… my quick guide to one of the best cities in the world… Budapest. Budapest was formed in 1873 with the unification of Buda, Óbuda and Pest. It’s the capital city of Hungary, is home to around 2 million people and is the 7th largest city in the European Union. There are literally thousands of things to do/see in Budapest – here are some of my favourites. At the end of Andrássy Avenue and in front of the City Park is Heroes’ Square (or Hősök tere in Hungarian). Built as a monument to the 1000 year old history of Hungary in the Carpathian Basin there are 14 statues of key historic figures and a huge obelisk in the middle. For the cultured amongst you there are the Museum of Contemporary Art and Museum of Fine Arts on either side of the square. We always use Heroes’ Square as a meeting point, which is a little silly as it’s so big it always takes 20 minutes to find anyone. City Park (Városliget in Hungarian) is to the east of Heroes’ Square and when the sun is shining it’s well worth meandering through its pathways. It can also be a lovely place for an early morning run or an early evening drink down by the lake. Take a trip up to the top of Gellért Hill where you can get an amazing photo of the city, especially on a clear night. If you want to be entertained go to the Sir Lancelot Restaurant on the busy Podmaniczky Road – it’ll be an experience you’ll never forget. The beer’s great, they bring the food out on huge wooden platters and the entertainment is hilarious. They have sword fights, belly dancers, singers, fire eaters and we even had a marriage proposal. You’ll be in there all night. The multi-award winning Gundle Restaurant is easily one of the best places in the world where I have eaten. The food, setting and staff are all outstanding. Make sure you leave room for a desert, they are out of this world. It’s just off from Hero’s Square so you have a nice walk around dinner. A great place to eat in the 6th District was the VakVarju Restaurant. We loved it because it’s a perfect for a large group of people and they serve real Hungarian food. After dinner go next door to the Boutiq Bar they have a great cocktail menu. You need to be in the know as they change all the time but if you get the chance, make sure you go to one of the Budapest ruin bars. These bars are setup quickly in inner-city abandoned buildings and attract thousands of party goers as quickly as they are created. Szimpla Kert has been there since 2010 and seems to be there to stay. Lonely planet voted it number 3 in the top 100 bars in the world, after having a great time in there I’d agree with them. Overall it’s a great place to do business full of dynamic intelligent fun people. Should be enough to get you started. Enjoy! About Me: Though originally born in South Africa, I have lived in the UK for a large proportion of my life, spending a year in the USA after finishing high school. I love traveling and definitely suffer from ‘itchy feet’ syndrome…the further the better for me! PARADISE…only two jumbo jets, a sea plane, a speed boat and 12 hours away. The Maldives, with pristine pure white sands, crystal clear warm waters and perfect weather…it’s life stripped down to simplicity! And I was lucky enough to spend my honeymoon there on the beautiful Island of Meerufenfushi – 2 weeks of pure bliss! We flew into Male, the capital, where you can either take a boat (about 50 mins) or sea plane (30mins) to the Island. Though the more expensive option, we opted for the sea plane and would recommend it to everyone, it was worth every penny! Most of the pilots are ex US/UK military and are known as the ‘bare foot pilots’…when all there is is sand or sea, there’s no need for shoes! The views are amazing, and you get to see a lot of the islands and the reefs. Because the waters around the island are so shallow the plane drops you off on a pontoon where you are picked up by speedboat and taken the short distance to the Island, where you are warmly welcomed with flowers and a cocktail. We stayed in a Jacuzzi Water Villa, a detached villa that stood on stilts in the sea. It was located at the end of a pier of about 40 villas, the way the villas are placed means you have a lot of privacy and an un-obscured sea view. We had our own private deck with Jacuzzi and stairs that went straight into the sea. We spent many a night there sipping cocktails under the stars. It was a long walk down the pier to our villa but that didn’t bother us, it wasn’t like we were in a rush! But do bear it in mind when booking.The island is about peace and tranquillity, so if you’re looking for a lively and full powered holiday this probably isn’t the place for you. For us it was about switching off our phones and laptops, lazing around by the pool, snorkelling, sailing, delicious food, copious amounts of cocktails and breath-taking sunsets. The Maldives is all about the sea life, and with still crystal clear waters you don’t even have to get in the sea to experience it. On our morning walks around the island (it took us one hour to stroll around the island following its waters edge) we saw stingrays, black tipped reef sharks, and even sea turtles. The house reef was a short boat trip away (which they ran several trips to each day) and was on par with anything you would see on the barrier reef – a massive variety of brightly coloured fish, sting rays, urchins, turtles, octopus, eels and so much more. Due to the shallow waters and the beautiful reefs underneath, they do not allow any motorised water sports, though there is still plenty to do – catamaran sailing, Maldivian line fishing (where they will cook your catch for you), kayaking, snorkelling and scuba diving, as well as tennis courts, beach volley ball, table tennis, and the weekly football match with the locals. What we loved most was that any time of day we could find our own secluded spot, be it on the beach or more in-land (though on an island that is 1200 meters long by 350 meters wide there’s not really an ‘in-land’)! We went full board (though I believe there is an all-inclusive option as well) – the food was varied and excellent, with lots of freshly caught fish and sea food. There were also two a la carte restaurants which we only visited once as the buffets were so good. They had some amazing cocktails, pricy but not too out of reach. A cocktail while watching the sun set over the ocean was a must! This place is truly paradise, and if you like the idea of feeling like you’re a million miles away from reality, switching off your phone and forgetting there’s anything past the beautiful blue sea, the Maldives is the place to go! SWITCH OFF YOUR PHONE AND FORGET ABOUT THE OUTSIDE WORLD! You will most likely have the same waiter for the duration of your stay, tip them at the start and they will make sure you’re looked after (above their normal high standards). Check if a coconut tree is laden with big coconuts before lying underneath it! Imagine a 2kg coconut falling 15m onto your head. Go all-inclusive or full board – eating and drinking can be expensive (it’s a secluded Island with no competition)! Out of everywhere that I have visited so far nothing quite beats the Caribbean. The beaches are the whitest and softest sand and the water is the perfect colour blue. The easy and slow pace way of life is exactly what I look for in getting away…to sit back on the beach and relax!! You cannot beat the endless sunshine (it does rain) and their renowned tipple…Rum!! There is quite a familiarity in Barbados to home as they are very passionate about their cricket and horse racing, both you are able to go see in nearby Bridgetown. I had the pleasure of meeting Sir Garry Sobers. My fondest memory was a local approached us and asked us out right what snow was like! It was something he was intrigued by…not being able to touch it. Make sure that if you ever travel to the islands of the Caribbean, that you go at the right time of year, avoid the hurricane season! The island of Barbados is quite small so if you hire a car you won’t be travelling for long however make sure you have a good map reader with you as there are no road signs! About Me: Passionate about cultures and languages; a Pole living in the UK. I love observing what happens when cultures ‘mingle’ … like a scientist I’d hold up a probe with cultures and stir them together. I am also one of the nerds who finds reading dictionaries more gripping than reading crime stories. Iwent to the Big Apple during summer 2004. Having spent just over 3 months in New York, I had the opportunity to ramble around the city and reach places which don’t make it to the city guidebooks. I went there with a friend of mine, a class-mate from Uni. She was tiny, fragile and a little bit scared to live in Brooklyn. A few weeks in, we felt at home, threw away the tourist maps and headed off deeper into the jungle. We found our best Sushi Place – Nanatori Japanese, off the Borough Hall subway station. We bought sweets in a very Russian Brighton Beach area and eventually moved from Brooklyn Heights to Bensonhurst to get into the Orthodox Jewish and Italian communities for a change. If you’re a street rap fan, head to Coney Island (the film Requiem for a Dream was shot there – although it’s not the only kind of movie they shoot in Coney Island!). How are the areas different to the minority districts in the UK or rest of Europe? Most often they are ghetto-like and reclusive. They are relics from the times of the first immigration influx. You will hear somewhat archaic language forms and find some old-fashioned sun-faded designs. If the zeitgeist scares you, head on to Brooklyn Heights which thrives these days and is considered a hip area in New York. Some likeable Facebook photos can be taken beside the Brooklyn Bridge, next to the River Café. Don’t forget to take your picnic kit and set out in the Prospect Park with friends. This is a massive park with a zoo adjacent to it, it’s worth adding it was designed by the same green-fingered engineers who worked on Central Park. I reckon the most breathtaking views of Manhattan are from across the East River. Why not take a Roosevelt Island Tramway and see for yourself. The tram will take you to Roosevelt Island – a tiny narrow island squeezed between Queens and Upper East Side. There is not much to explore within the island itself, just blocks of flats, a mental health institute and some retirement houses. Sit on a bench, next to an elderly couple, watch ‘choppers’ circling around the UN Headquarters and have a very Long Island Ice Tea gazing at the lights when Manhattan prepares for another sleepless night. When it comes to the cuisine, it takes the best of all the ethnic diversity. My personal favourites were: a toasted bagel with salmon and soft cheese, plain pizza (very greasy) or a Waldorf salad. They say if you don’t like the English weather, wait five minutes. Similarly, don’t cling on to my notes – things change here really fast. Pronounce Manhattan as Mahn-atn – a way of showing due respect to the city. You are going to be considered a New Yorker as soon as you step off the plane – so ya betta follow da rules. Otherwise wear sandals, white socks, cover your head with a large-format map and get mugged on your first trip around the town. Don’t get annoyed if they ask where Europe is. It’s just further east of Long Island. That should do. What do they care about the rest of the world – it’s “smaller than Mahn-atn anyway”. Don’t look them in the eyes but be open to have a chat with a stranger while on subway. Not sure how it goes together but you’ll figure out when they wish to talk about their private life. The world is small, New York lodges everyone. Don’t be surprised about bumping into your home-town neighbour. Odds are your childhood friend is in the Big Apple at the same time as you!